In today’s business environment, technology is the driving force behind the success of any business. More and more forward-thinking business owners are integrating advanced IT solutions and services to help streamline their company’s operations to increase efficiency, productivity, and boost their bottom line. However, too many businesses are becoming overly dependent on their technology, leaving them vulnerable when something goes wrong. Total Computing Solutions believes that technology should be used to enrich the lives of its users and should not be overused to the point of dependence. This minimalist philosophy is what sets us apart from other IT companies. You can be confident knowing that every piece of equipment and every solution that we sell you is appropriate for your company’s operations. Most small-to-medium sized business can’t afford their own in-house IT staff and without the experience and in-depth technology knowledge, they aren’t able to take advantage of the tools and services available. Total Computing Solutions takes the place of your in-house IT staff and more. Not only do we offer first class break-fix services, we also manage and maintain your technology to create a comprehensive and affordable IT solution, custom tailored for your company. We serve a wide range of clients, primarily located in the Greater Green Bay area and throughout Northeast Wisconsin as well. We have a wealth of experience in offering tailored services to a wide range of industry types. We pride ourselves on providing you with the highest level of customer service in all of our interactions and strive to treat you with the utmost respect and value that you deserve. Don’t settle for generic, inexperienced IT service providers. 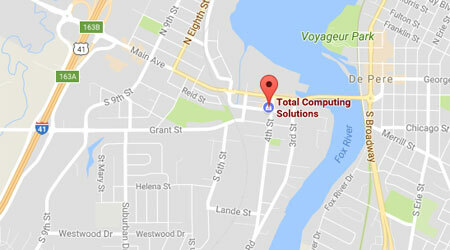 Total Computing Solutions offers you a lifetime of experience and knowledge in small and medium business technology. To learn more about what we can do for your company, contact us at service@tcsdepere.com or (920) 569-2681 to speak with a member of our team today.